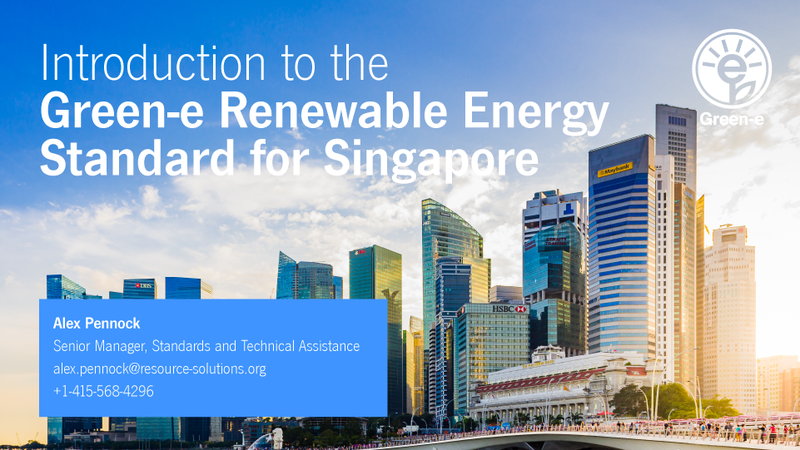 Center for Resource Solutions (CRS) just released the Green-e Renewable Energy Standard for Singapore, which details the requirements and standards for Green-e certification of renewable electricity sales and consumption in Singapore. The new standard defines eligible renewable resources, requirements for customer disclosure and transparency, and use of renewable energy tracking systems. With the release of this standard, large buyers and clean energy sellers in Singapore can apply for Green-e certification of their retail renewable electricity and energy attribute certificates (“EACs”). This country-specific standard is the first one launched outside North America. This webinar will walk the listener through the key goals, requirements, and uses of the Standard. There will be time at the end for questions, and the webinar will be recorded.